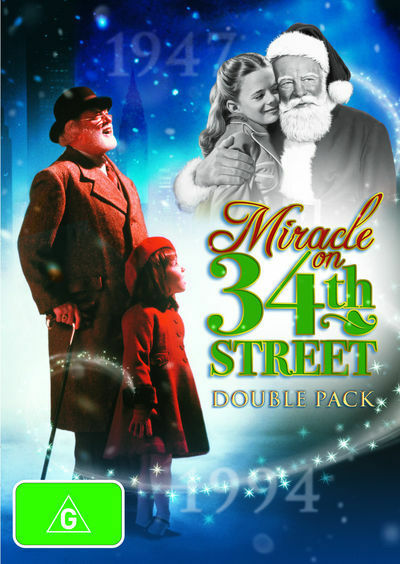 This double pack includes Miracle on 34th Street 1947 DVD and Miracle on 34th Street 1994 DVD from DVDLand. These 2 great movies together in this 2 DVD set. Genial old Kris Kringle is hired by Macys Department Store in New York to be their Santa Claus and then surprises everyone by claiming to be the real Father Christmas. His claims lead to his arrest and trial and some very unlikely conclusions. In this new holiday "miracle", based on the famous 1947 film classic, a little girl discovers dreams can come true if you really believe. Six-year-old Susan Walker has doubts about childhood's most enduring miracle - Santa Claus. Her mother told her the "secret" about Santa Claus a long time ago, so Susan doesn't expect to receive the most important gifts on her Christmas list. But after meeting a special department store Santa who's convinced he's the real thing, Susan is given the most precious gift of all - something to believe in. Starring Richard Attenborough, Elizabeth Perkins, Dylan McDermott and Mara Wilson as Susan. This uplifting and joyous film will make believers out of the entire family. Click the button below to add the MIRACLE ON 34TH STREET (1947) / MIRACLE ON 34th STREET (1994) to your wish list.